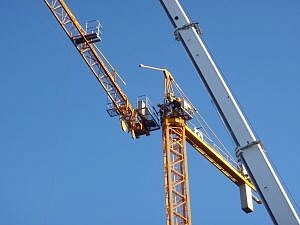 The Potain MC 50B is a hammerhead tower crane with square 1.2m or 1.6m tower sections. Constructed on site usually with a mobile crane, out of small tower and jib sections with many different configuration options. Maximum freestanding 40 meters with a 1.2m and 1.6m tower combination. If required other freestanding options are available. Using a concrete gravity base or balusters generally described in the Potain data sheets. Can be controlled directly from the cab or remotely by the operator.